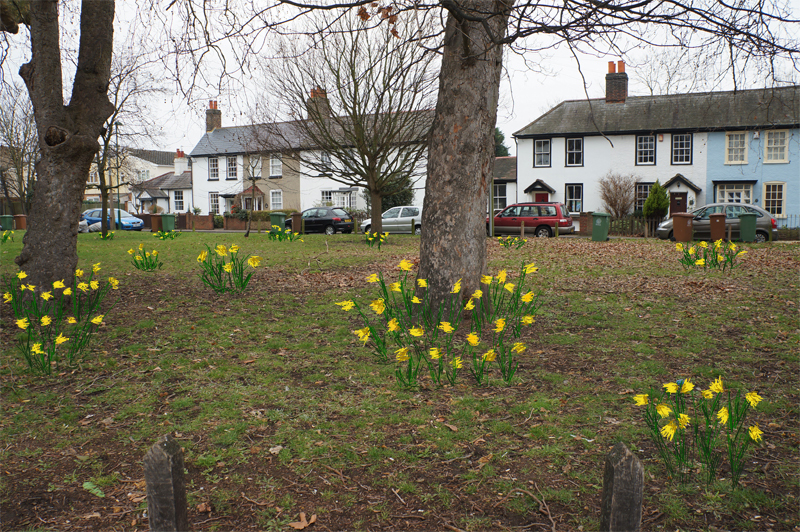 A small green with huge plane trees, surrounded by listed cottages was the subject of a challenge to plant 3000 bulbs donated by Sutton Council. This challenge was taken up by the children of Hackbridge Primary School and local residents. Lysanne Horrox, a member of the Hackbridge & BC Neighbourhood Development Group organised the event over three days where The Green saw up to 500 young children planting daffodil and crocus bulbs. 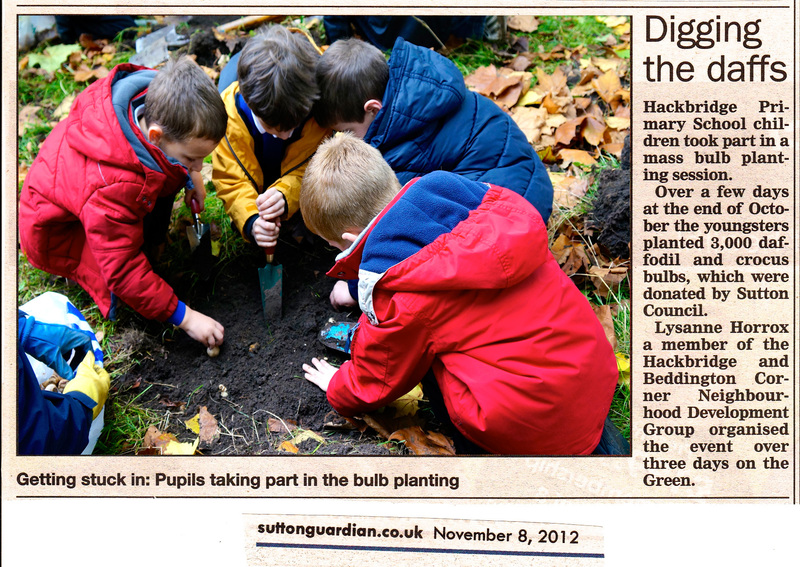 Every child at the school had the opportunity to plant some bulbs. Despite the damp and foggy weather, it was wonderful to hear the merriment of the children, the odd scream when they found a worm and their new daffodil dance when putting the dug out turf back over the bulbs! It has been a great community opportunity and have got the local residents talking to each other. More importantly was getting the local children involved in horticulture. The children have planted their legacy in this small historical part of Hackbridge and will be able to see their flowers grow when walking to school next Spring. This was a great opportunity to get local children involved in planting bulbs, which will ensure that The Green will be full of colour in Spring 2013. The children all enjoyed the planting activity and will be able to see daffodils and crocuses bloom on The Green, as they pass by on their way to school. Well done Lysanne for making this happen and thanks in particular to Peter and Chris from the NDG for all their digging!